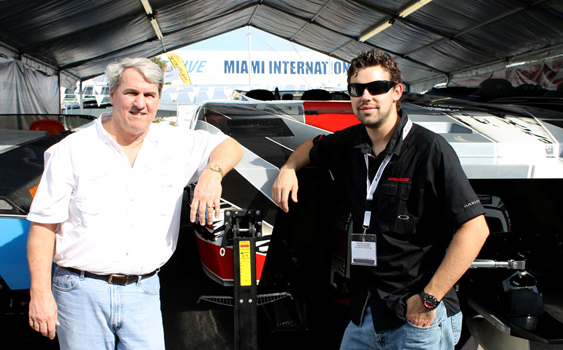 OSO members Chuck Sprague, aka C_Spray, and Dan Kleitz, aka OL40SVX, take some time to talk performance boats during preview day at the Miami International Boat Show on Thursday. MIAMI — This is my eighth Miami International Boat Show in as many years. And albeit my experience at the world’s biggest boat show probably makes me credible enough to run through my list of highlights from this year’s showcase, I figured it would be a little more fun to catch up with some of the keyboard wizards who take this industry as seriously as me (or more). Enter Chuck Sprague, aka C-Spray on the OSO message boards. I met up with Sprague at the Formula Boats display. Sprague, an owner of a 382 FAS3Tech model from Formula with 600-hp Volvo Penta engines, couldn’t wait to head over to the Ilmor Marine booth to see what the company had to say about its new MV8 570 engine (check out the full story here). Sprague, who lives in Pennsylvania and also owns a 28-foot bat boat with an Ilmor 725 engine, was like a kid in a candy store. But you know what? He’s been like that every year since 1999 when he came down to purchase a new go-fast boat. And I’m guessing Sprague isn’t the only one who gets extremely giddy walking into the halls of the Miami Beach Convention Center. Sprague, who worked for Penske Racing for more than 30 years, had no trouble walking the show and grabbing the ear of Mike Livorsi of Livorsi Marine or Paul Ray from Ilmor. In fact, we hit a half-dozen of the major performance boat manufacturers and Sprague had no intention of calling it quits. He’s planning to spend three more days walking the show and visiting the in-water portion at Sea Isle Marina to make sure he doesn’t miss a thing. 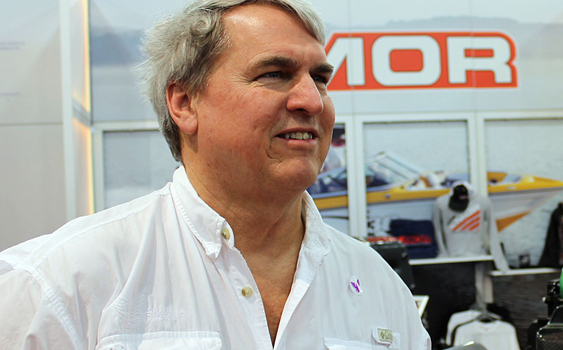 The owner of a 28-foot bat boat with an Ilmor 725 engine, Chuck Sprague made sure to stop by and say hi to his friends at the Ilmor Marine display. Wrinkleface, aka Tracy Nemeck, and OL40SVX, aka Dan Kleitz, couldn’t wait to share their stories with C-Spray outside the Outerlimits Powerboats display. It’s amazing how the Internet brings these folks together from all over the country (or the world). Nemeck, a 21-year veteran of the boat show who ventures to Miami every February to escape the cold weather in Michigan, said he looks forward to meeting anyone and everyone at the show each year. Cash Bar, aka Greg Harris of Fort Lauderdale, Fla., has the same opinion. There’s no doubt that’s the case. In fact, I’m guessing that the Miami show will be swarming with OSO members before the weekend is complete. So, if you’re in Miami, just make sure to ask anyone you meet, “What’s your screen name?” If they don’t know what you’re talking about, that’s OK. If they do, you’re even better off.